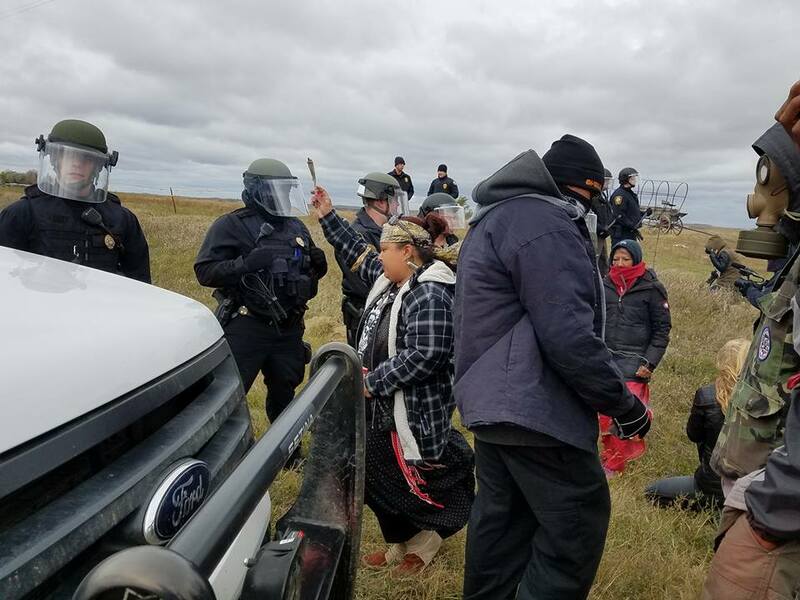 Excessive police force protecting illegal construction operations of Dakota Access Pipeline, as Federal Appeals Court continues temporary halt to DAPL construction today. Morton County police showed up with excessive force to stop the prayer today. 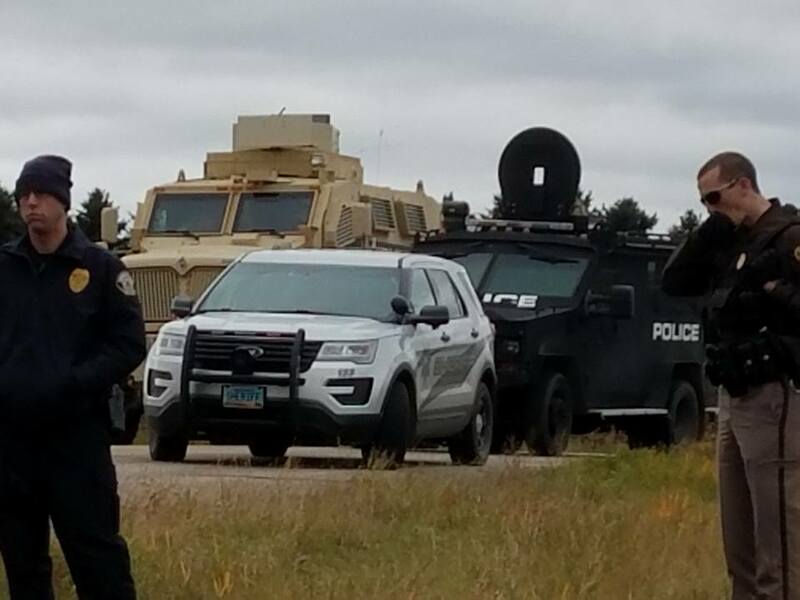 Water protectors were blocked from a public access road, once again by an armored police vehicle, sound cannon (acoustical weapon vehicle) and armed police force. 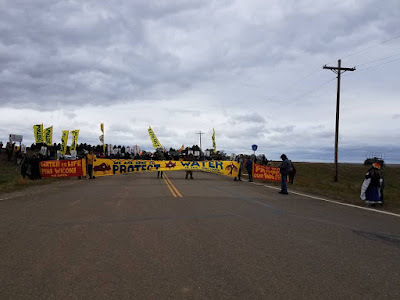 Water protectors were unarmed as usual and planned to pray. 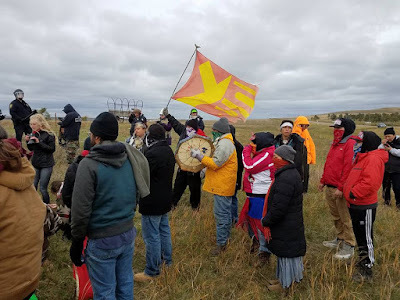 However, police denied access to the public road where DAPL has continued work in violation of a court order from the Federal Appeals Court in Washington. DAPL construction work was halted when the news arrived that the water protectors were on the move. 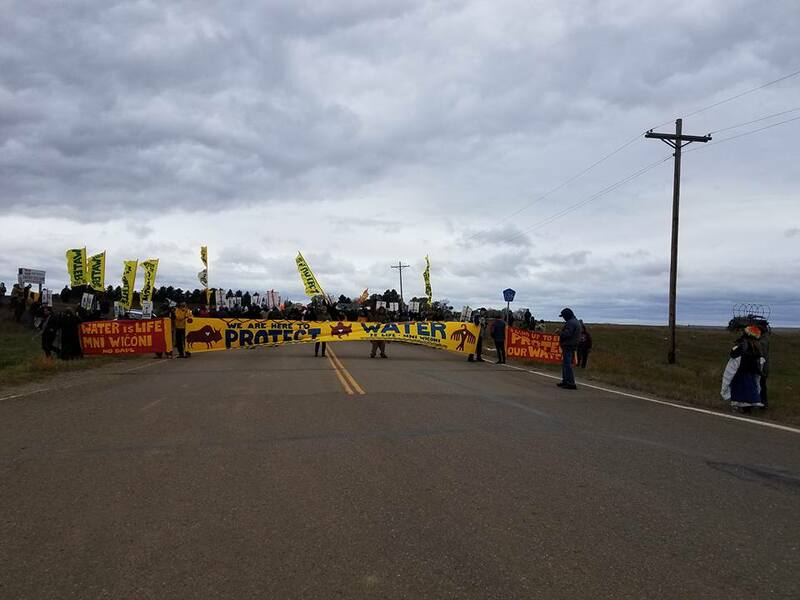 Today, in Washington, a federal Appeals Court continued the halt to DAPL construction. North Dakota continues to escalate repression of the people protecting sacred sites and waters from the Dakota Access Pipeline. On Tuesday, two more felony charges were sought for water protectors, bringing the total to seven. 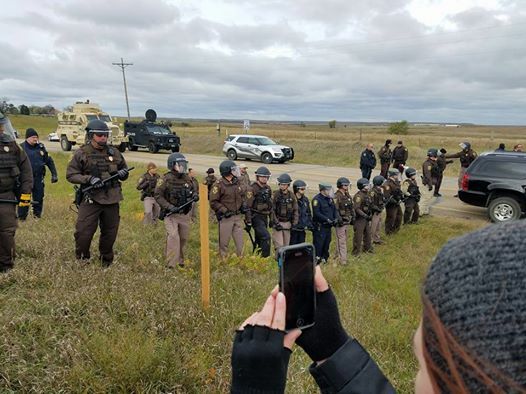 One of the we charges is against Dale “Happi” American Horse, the first person to lock to lock his body to active Dakota Access Pipeline construction equipment.This comes days after a heated exchange at a prayer ceremony when police abruptly dispersed the crowd with shotguns, a Bearcat armored vehicle and a Mine-Resistant Ambush Protected (MRAP) vehicle. 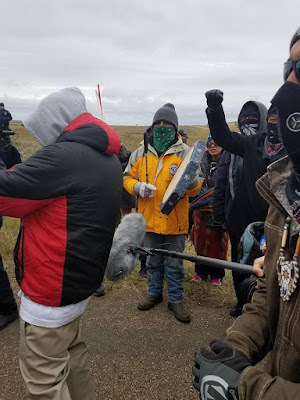 Dale “Happi” American Horse, the first water protector to lock his body to active Dakota Access Pipeline construction equipment (on August 31), appeared with his court appointed counsel, Steven Balaban. His misdemeanor case was dismissed and then refiled as a felony case. The new charges include one count of felony Reckless Endangerment, one count of misdemeanor Obstruction of a Government Function, one count of misdemeanor Preventing Arrest, and one count of misdemeanor Disorderly Conduct. Despite the gravity of these new charges, American Horse was undaunted. 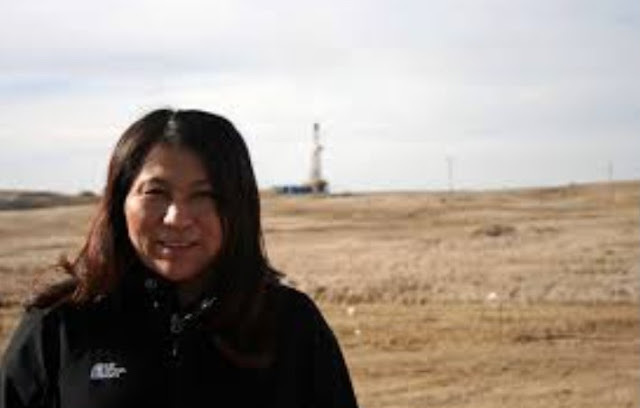 “We as protectors are not intimidated when it comes to defending Mother Earth, either on the front lines or in the courtroom,” American Horse said. He remains free on a $500 bond, and trial was set for December 23rd. Mason RedWing of the “spirit riders”, a group that patrols actions on horseback to protect people praying on the front lines, appeared this morning on two active warrants, one misdemeanor and one felony. He was charged with felony reckless endangerment of law enforcement and a second felony count of terrorizing law enforcement for allegedly riding his horse towards the police line. His bond was set at $2000. He was taken into custody and released on bond. 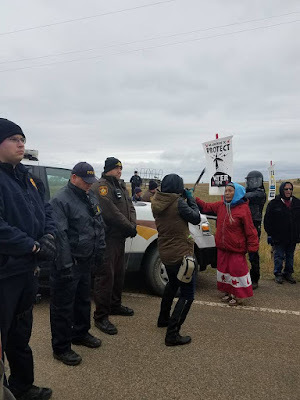 Seven water protectors who were arrested without warning for failing to disperse from a Dakota Access work site on September 13th appeared in court this morning for arraignments. All who appeared entered pleas of not guilty and are scheduled for trial in late December and early January. Twitter button not working on these blogger posts. I'm tired of all the Censoring that is happening on topics like this in the US. Time to blast Twitter and get this resolved. I'll even boycott them if that is what it takes. The only way to make sense of why anybody would back parasitic corporations that ravage without thought or conscience is to understand the limits that were installed in your average cops from childhood on. Ie. In the average school, the kids are taught that there only five senses. That's not true and even research has shown this. Since at least 1984. Researchers have cataloged seventeen senses, but, the public is never taught this. The reason being, if one learns about how many senses they REALLY have,one starts opening up to some of those other senses and it destroys the control of the socially engineered paradigm. That's at least part of the reason law enforcement acts like storm troopers. They don't know who or what they truly are. the young man is right. Most of those cops NEED PRAYER and visualization to make the necessary leap. Enough is enough, Prayer and using Twitter...I agree 100%! (that does not include freedom to be a racist, sexist, bigot because that takes away other peoples freedom). No more twisted lies ! It's like in India with Mahatma Ghandi. Satyagraha will put the shame on the aggressor. On and on and on. Make sure the news is going viral all over the world. 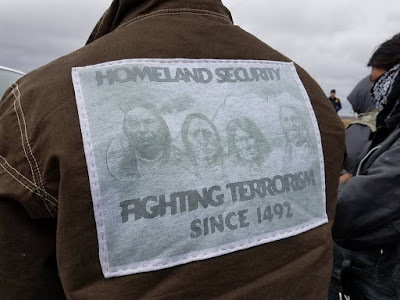 It's a historical moment where the native Americans can change their destiny (and ours of course). So keep the head up en stay strong. You have the natural courage. The world is watching. You all have a lot of support.